Worthing United chairman and caretaker boss Bill Clifford says the club are set for an ‘interesting tie’ in their SCFL Division 1 cup clash with Bexhill United this weekend, after they stormed to their second straight win on Saturday. Mavericks overcame rock-bottom side St Francis Rangers 5-1 in a convincing victory. Back-to-back league wins have propelled the side from the foot of the table to 14th place. An early opener from Keiran Deacon put United in front but Ross Jones equalised for the away side just before half time. 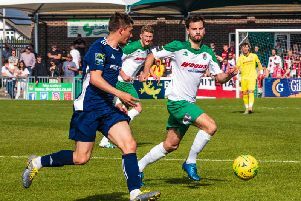 Mavericks came out strong in the second half, however, and goals from Toby Funnell, Craig Nagle, Joe Patching and Omar Ndayako secured a deserved win. On the performance, Clifford said: “I don’t think we played as well this week as we did the week before. The first half wasn’t great, we took an early lead and then relaxed and took our foot off the gas. But we were much better second half. Clifford also admitted that there had been no update on the managerial front and also ruled himself out of the running for the job.